Poedua is an oil painting on stretched canvas, meaning the composition is painted on a fabric support which is stretched to keep it evenly tensioned, over an expandable wooden stretcher. 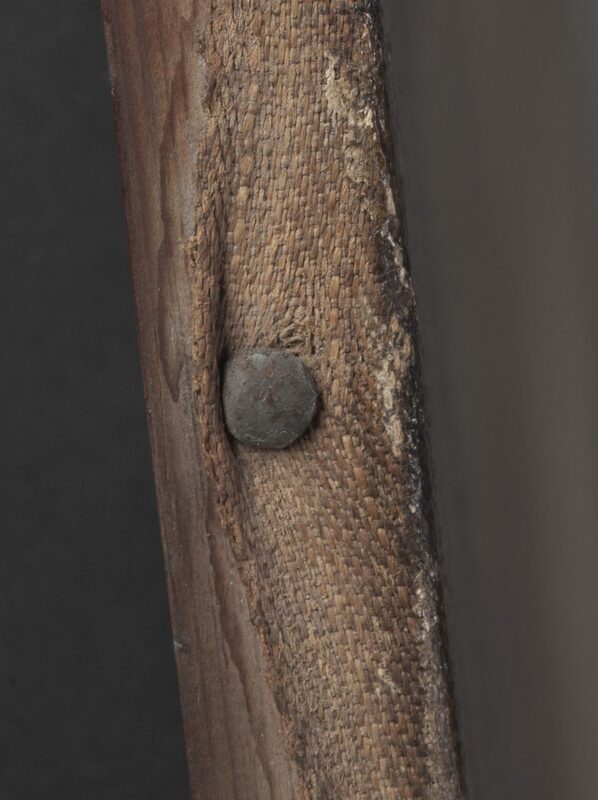 Canvas supports began to replace traditional wooden panel supports from about the 16th century and were the most commonly used type of support by the 18th century. The canvas used for this painting is probably linen (untested) and it has a twill weave, which creates a distinct texture which is visible through some areas of the paint layer. Linen is a common support for paintings of this age, but other fabrics are also used as supports for paintings, including hemp and cotton. The canvas is attached with small metal tacks around the sides of the stretcher bars. 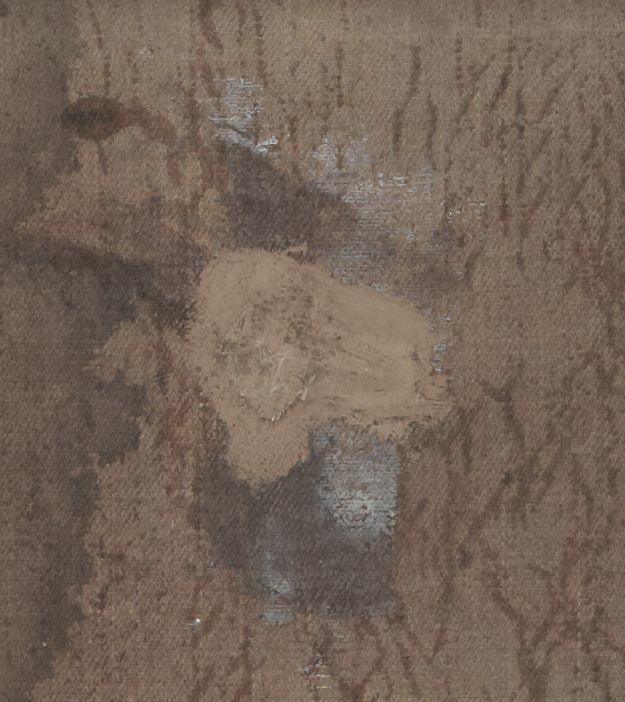 We think there’s a good chance that this is probably the original attachment because there are no old holes in either the canvas or the stretcher, which can indicate that the canvas has been taken off in the past. The back of the canvas is no longer looking as it would have when Webber first painted it! The canvas is made of a natural fibre which has darkened and discoloured because of the process of ageing and deterioration. We have found the canvas to be in quite a good condition, given its age. There are a few areas we will need to address in our treatment, including some small tears and embrittlement around the edges. This has occurred because over time the fibres have become inelastic and snap rather than stretch. There are some areas of damage which we can’t determine the extent of just yet because they have been covered with patches on the back. The back of the canvas is also dirty from being exposed to the world for the past 226 years! There is a layer of dirt and some staining present, which are a combination of age-soiling and various deposits and residues. We hope to be able to reduce some of this soiling with cleaning, but this action probably won’t dramatically change the way the canvas currently appears. What we hope to achieve is a reduction of the dirt matter, which if left, can accelerate deterioration. An interesting discovery for us is that Poedua has never been lined. Lining is the attachment of a new support to the entire reverse of a painting on canvas. Its aim is to give additional support and reinforcement to a weakened or damaged canvas. It was a very common restoration procedure in the past and most paintings of this age have been lined at some point. 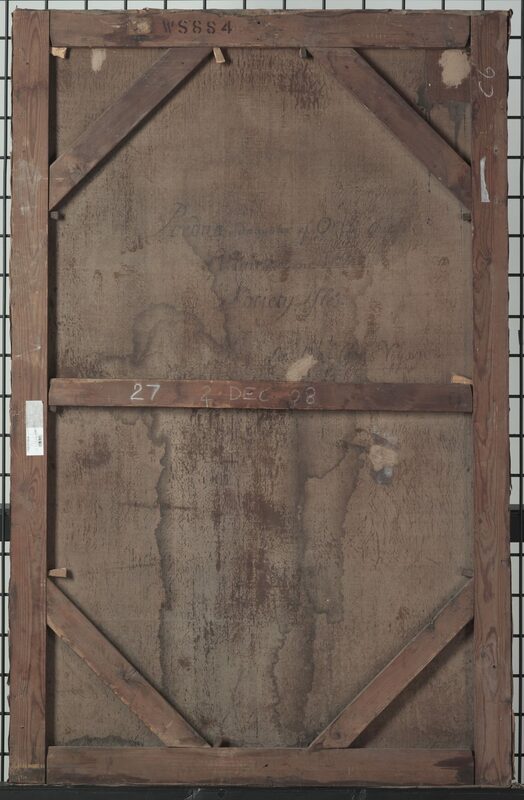 The fact that the canvas has remained unlined means that we can see the back of the original canvas and a lovely inscription, presumably by the artist himself. This is a fascinating process – thanks for blogging about it.